Refresh, rejuvenate, and energize your body, mind and spirit. Refresh, rejuvenate, and energize your body, mind, spirit with these powerfully relaxing gongbath meditations. 1. 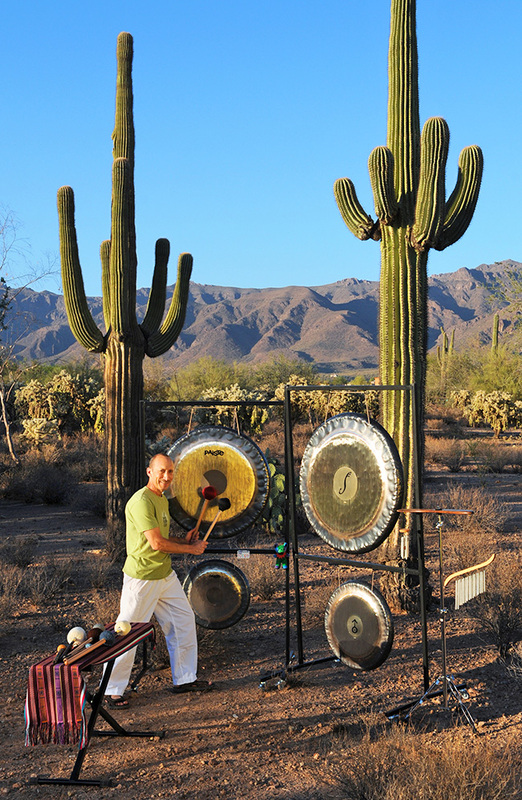 The Seven Chakras (41:29) is a full-length gongbath played exclusively on Mr. Charlie. Based on the principle that different areas of the gong correspond to and resonate with each of the seven major chakras (see illustration), during this gongbath I focus on each of the chakra areas, starting with the root chakra and working up to the crown chakra. Once there, I work the gong up and down, left and right, in and out, etc. in an effort to open up any blockages, release pent-up energies, and bring the listener's chakras into balance. The eighth chakra, or aura, corresponds to the rim area of the gong. Listen to the "Tsunami recording on my Shelter of Peace CD to hear an intense playing experience that focuses exclusively on this chakra. 2. Hine Mah Tov (11:26) I start with a brief chant in Hebrew: (transliterated: "Hine(y) mah tov u'ma-nayim, Shevet a-chim gam ya-chad"), which is translated "How good and how pleasant it is for brothers [and sisters] to dwell together in unity." These words are the first verse of Psalm 133. I have three older brothers and we love to sing this whenever we all get together. Gongs used: Mr. Charlie, Sylvia, Al Tira, and Ehyeh Asher Ehyeh. 3. [Get Your Daily Dose of] Vitamin G[ong] (11:46) This meditation gets its name from a (more-or-less) daily practice that my wife, Ellen, and I have. We love to start each day together with a few minutes of breathing, meditation, and prayer. Then I play the gong for about 10 minutes while Ellen enjoys. We call that our "daily dose of Vitamin G" and it really gets our day going with a positive vibe! This piece and Hine Mah Tov are brief but effective gong meditations that you can use to "get your daily dose" if you only have 10 minutes or so for a gong meditation. Gongs used: Mr. Charlie, Sylvia, Al Tira, and Ehyeh Asher Ehyeh.